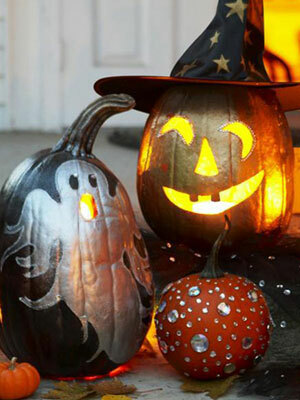 I just had to share these awesome pumpkin ideas I just found on GoodHousekeeping. Studded with self-adhesive craft store jewels. Add a little height to some of them with candle holder stands or even small cake plate stands. Love this idea. Some vinyl for the witch and some styrofoam for the stars. Get the downloadable templates and all of the haunted how-tos. What a great idea this is. Could be for the front door or just inside in your entryway. 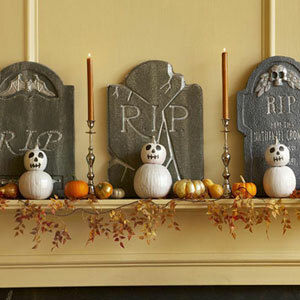 White painted gourds make the “pumpkin skeletons”, add some gold painted gourds around them and add in some store bought tombstones. What a “grave mantel” this is. Love it. Check out this butternut squash with a “Scream” face on it. It was painted copper first though. I love the idea of putting the little candies into some black tulle with orange sparkles. 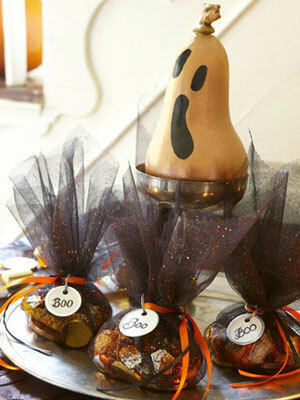 Such a cute idea for a Halloween party at your house. These jack-o’-lanterns are painted with metalic paints, added some sequin strips to the witch’s eyes and glitter glue to outline the ghost. What great ideas. 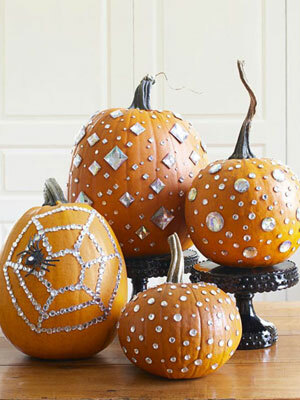 Plus you can’t forget to add a studded pumpkin to the mix. Check out these kitties!!! Pick large pumpkins for the bodies, smaller ones for the heads. 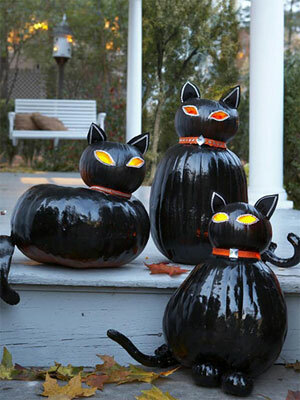 Use some glossy black paint, and carve almond-shaped eyes. Use felt for the ears and collars. And don’t forget to add some rhinestone to outline the ears, eyes & collar. This is an awesome idea to do with the kids even. Let them get creative with how they want their cat to look. 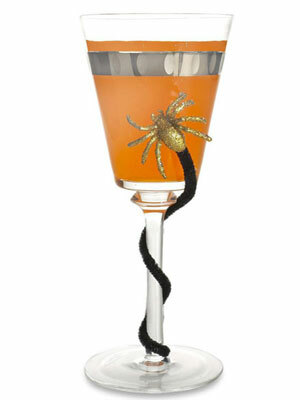 Black pipe cleaners, different colored spiders, give you a cute “charm” for your guests glasses so they know who’s is who’s potion. 😉 What a cute idea for a Halloween party at your house. Well I hope you have enjoyed all of these ideas as much as I have. I will have to save some of these ideas for next year now. 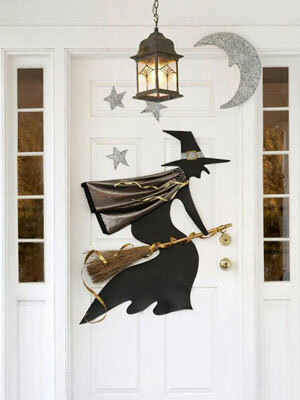 So what decorating ideas have you come up with this year for the Fall or Halloween. Let’s share. I love to see what my followers are doing.